It's Crunch Time For The Red Wings! When we saw the Detroit Red Wings defeat the Florida Panthers on March 19, 2016, 5-3, it appeared that a win in South Florida could be a sign that they would be on their way to a 25th straight playoff appearance. On this night, the Red Wings would overcome a 3-1 deficit and defeat Panthers star goaltender Roberto Luongo. He was out dueled by Red Wings netminder, Jimmy Howard, who won his second straight game. The atmosphere at the BB&T Center was Electric as a Panthers Record 20,817 fans showed up against a team which does pack this arena. There was a Red Wings flavor before the game as an Octopus hit the ice in Sunrise, FL. Red Wings defenseman Niklas Kronwell returned to the Red Wings line-up. Red Wings Announcer Paul Woods mentioned to me before the game that Detroit was 6-7-1 without Kronwell in the line-up. The Panthers fans got their first look at Red Wings rookie right wing Anthony Mantha (6-5, 214), age 21 1/2 years old. He was playing his third NHL Game. The Red Wings had their fair share of challenges during the game as Florida was 33-5-6 when scoring the first goal of the game. Tack on another loss for the Panthers. Florida was 15-6-4 when tied after the first period. Once again, add another loss for the Panthers. The Panthers were 15-6-1 against the Atlantic Division, and the Red Wings defeat gave Florida a seventh loss. This win earned the Red Wings a day off to spend time on the Fort Lauderdale beaches as it had time to get ready for a huge showdown with the Tampa Bay Lightning three nights later. Red Wings Head Coach Jeff Blashill came away pleased with the offensive effort by his team. "I thought we did a good job for the 60 minutes," Blashill said. "That was our biggest focus; we've talked about it a lot. Making sure we play 60 minutes and making sure we're resilient. And when you get scored on, just keep going. "The one thing with the offense was we got to the net and we're going to continue to get to the net to be successful here. That's the only way you're going to score in this league over, and over and over again and we found a way to do it." The BB&T Center may not be Joe Louis Arena, but it had a Red and White Flavor to it. Blashill described the atmosphere as, "When we play here, there's a lot of fans who spend winters here. When we come, there's always a good crowd here; a good mix of both fans." I've covered a lot of games between these two squads and I would estimate that at least 45% are Detroit fans and they're quite vocal. Since the Red Wings important win versus Florida, Detroit has gone 2-3 in that stretch. Tampa Bay blew out Detroit 6-2. In these five games, Detroit has allowed 22 goals. This isn't the time for the goaltending to go South for the Spring and to end their long playoff streak. The Philadelphia Flyers (38-25-13, 89 points) hold the Final Wild Card Spot. They have a game in hand over Detroit having played 76. In 77 games, Detroit is 38-28-11 with 87 points. Even if the Red Wings were to overtake the Flyers, I can't imagine Detroit winning s series against the Washington Capitals, who are 54-16-6 with a 114 points. Detroit's best chance of making the playoffs may actually be overtaking the Boston Bruins, who have also played 77 games. The Bruins are 40-29-8 with 88 points in the Eastern Conference, Atlantic Division. If Detroit surpasses Boston, there potential match ups could include Tampa Bay or Florida. I can only imagine what the crowds will be at the BB&T Center if this occurs. Detroit does face the Philadelphia Flyers in one of its remaining five games. For whatever it's worth, if the Red Wings were in the Western Conference, 87 points gets them into the playoffs. The first team out as of this post is the Colorado Avalanche with 82 points in 77 games. But GM Ken Holland would have to log some extra miles in the Western Conference. But we'll never know now. So it will be interesting to see if this playoff streak is extended. Expect the next five games to be the most intense hockey that Red Wings fans will watch in a long time. The Red Wings host the Minnesota Wild on Friday at the Joe Louis Arena. Then, three of the final four games are on the road. They'll face former Head Coach Mike Babcock in Toronto, Philadelphia at home then wrap-up the season on the road against Boston and the New York Rangers Finale on April 9th. It doesn't get any tougher than this! Nothing like controlling their own destiny and pile up as many points as possible. No need to scoreboard watch or no motivational speeches needed! We'll see if Detroit enters it's Final Season in Joe Louis Arena with 25 consecutive post-season appearances. If the Red Wings playoff streak comes to an end, it won't be the only steak that ends. There will be no Canadian based teams in this year's tournament. It will be be the first time since 1970, a span of 46 years that this didn't happen. So now, "It's Crunch Time For The Red Wings!" On March 23, 2016, the Houston Astros defeated the Philadelphia Phillies 2-1 in what appeared to be their last game at Osceola County Stadium. If everything goes according to plan, Houston and the Washington Nationals will move into a new ballpark in West Palm Beach, FL in 2017. On March 11, 2016, the Detroit Tigers faced the Astros and this stadium brought back some nostalgic memories as I returned here for the first time since 1985. Back then, I was a Sports Writer for the Tampa Tribune. I was covering the Florida State League (FSL) All-Star Weekend during the stadium's first year of operation. That weekend, I had the good fortune to meet Hall of Fame Pitcher Sandy Koufax. This was the first year of Spring Training for the Houston Astros and their Class A Advanced Team the Osceola Astros. What stood out about this game wasn't the score of the Old-Timers Game or The All-Star Game. Instead, it's what happened in the Press Box. For the weekend, I used a Tampa Tribune Computer which had "Rotary Phone Cuffs" where you stick the phone in and transmit the story through the land line. Ah yes, the technology of "Yesteryear." After the game, I had both my stories done and attempted to send two articles. I repeat, I attempted to send two articles. Needless to say, after six attempts, I was unable to get them to the Tampa Tribune. Luckily, My Desk Editor Rick Nelson was able to extend my deadline to 12:30 AM with the cooperation of production. I dictated the two stories to Rick for 25 minutes and when I saw it in print, Nelson did an outstanding job when I returned to Tampa and saw it in the paper. These stories are framed in My Office at home. As I reminisced with my longtime friend Lynn Henning (in the photo) of the Detroit News, he said, "that had to be traumatic for you." I told him I was the oldest 22-year old that night in a building which was working out the bugs after being open for just four months. There wasn't any gray hair and I was MUCH THINNER back then, weighing in at a whopping 135 pounds. Before and during the game, I was sharing this experience with Astros PR Guy Chris Peixoto (25) as well as the Tigers PR tandem of Aileen Villarreal and Michele Wysocki. Like Peixoto, Wysocki wasn't even born. Villarreal, Wysocki and Peixoto actually gleamed as I was talking about this experience. Their version of technology is far different than what many of us "old school" media types had to work with. During my years of covering Spring Training, I've rarely attended a game with a clear cut story idea. But as we drove 2 1/2 hours North up the Florida Turnpike, and weeks leading up to this, this was an obvious story idea. Besides, on the road, you never know what players will travel with the club and will be available. On this day, the Detroit Tigers sent familiar names to Osceola County Stadium. Alan Trammell was throwing batting practice, GM Al Avila was around, in addition to Miguel Cabrera, Jose Iglesias, Ian Kinsler, Anthony Gose, JD Martinez, Victor Martinez, Bruce Rondon along with top prospects JaCoby Jones and Steven Moya. Prior to the game, I had a chance to ask Tigers Manager Brad Ausmus about his thoughts and memories at Osceola County Stadium. Ausmus, 46, is seven years younger than I am. He played for Houston from 1997-98, and again from 2001-2008. "I had a lot of memories having been here 10 years," Ausmus said. "There were some good restaurants. There were some good and tough times." "One thing that stood out was moving into a new facility after it was renovated. We really had a small and old major league clubhouse. When it was renovated, we really had a small and old major league clubhouse. When it was renovated, and we moved into this new building, it was a major upgrade." On Monday, March 7, 2016, The Tampa Tribune printed out it's last paper in it's downtown 202 S. Parker Street facility off The Riverfront. The Tribune will be joining forces with the Tampa Bay Times with the production operation being relocated to St.Petersburg, FL. The editorial staff moves out in May into another Tampa Office. My old stomping grounds will be torn down for a new apartment complex. I worked at The Tampa Tribune from 1984-1986. I had the pleasure of working with some of the best colleagues during my development as a Sports Writer. 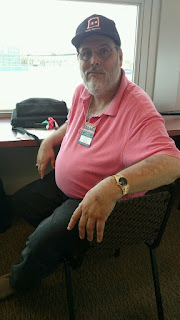 My All-Star line-up includes late Sports Editor Tom McEwen, Joey Johnston, Chris Harry, Mike O'Keefe, Jim Henry, Herb Branham, Nick Pugliese, Roy Cummings, Executive Sports Editor Joe DiSalvo and Nelson. Johnston gave me a strong recommendation to get the FSL beat, and DiSalvo gave me the free reign to do whatever I wanted to keep it interesting. Nelson helped me get a free lance writing job with RedsVue Magazine in Cincinnati. 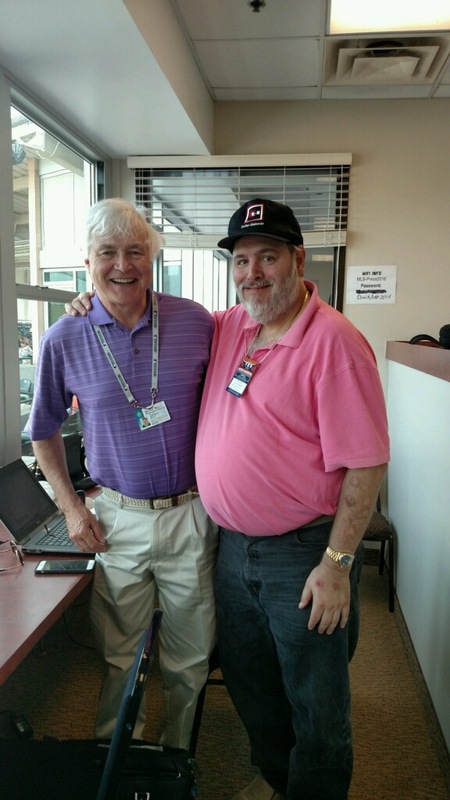 He edited my stories for both the Tribune and RedsVue as I covered the Reds Class A Advanced League FSL Tampa Tarpons, plus all the Reds Fantasy and Spring Training assignments. But on this 1985 FSL All-Star Game, it was A Night to Forget and a Night to Remember. I got an on the job training lesson that you won't get majoring in a Mass Communications Curriculum in college. Boy did I ever! Yet, when I think about the advances in technology, the words internet, wireless, net books, laptop computers, tablets and smart phones have turned technology upside down. It's great to tell stories about the Wonderful World of Yesteryear and for the Tigers vs Astros contest, I even had the opportunity to sit in My Old Seat in the Press Box at Osceola County Stadium with the only difference being that I weighed 260 pounds, sporting gray hair and facial hair. To this day, the best job I had in college was working at The Tampa Tribune. On March 11, 2016, it seemed like June of 1985 all over again, only without the deadline pressure, but the technology was working as I prepared this story. Nelson taught me to be composed under pressure and I've used that into my adult years in every situation imaginable for the most part. We all have our moments of extreme frustration, but mine are much less as they were before. Yet, once again, I'm very proud of what Nelson and I accomplished in June of 1985. As for the Tigers vs Astros game, Cabrera hit the most exciting fly ball to not leave the stadium in front of 4,237 fans. Meanwhile, Moya hit his third home run of the spring. When we saw the Astros last spring on Sunday March 8, 2015 at Lakeland's Joker Marchant Stadium, Houston hammered Detroit 14-9. The Astros would reach the playoffs and defeated the New York Yankees in the first round. With the Tigers numerous off-season moves, it will be interesting to see how this season plays out. But as I look at Osceola County Stadium 31 years later, it's a beautiful ballpark and it's cozy 5,300 capacity is the smallest in Spring Training. Yet, The City of Kissimmee, FL has done an outstanding job taking care of this venue. It looked even better on this 81 degree sunny afternoon in Central Florida, watching the "Boys of Summer" reminiscing about "Memory Lane" for those that wanted to hear me at the FSL All-Star Weekend that I can now laugh about. The Tigers lost to the Astros on this day 10-4, but that was a mere after thought.